Djamila Grossman | The Salt Lake Tribune The Grizzlies' Brent Gauvreau, 27, and the Idaho Steelheads' Chris Hepp, 3, try to control the puck during a game at the Maverik Center in West Valley City, Wednesday, Jan. 12, 2011. Idaho won the game. Djamila Grossman | The Salt Lake Tribune The Grizzlies' Giffen Nyren, 55, reacts to his team's loss against the Idaho Steelheads at the Maverik Center in West Valley City, Wednesday, Jan. 12, 2011. 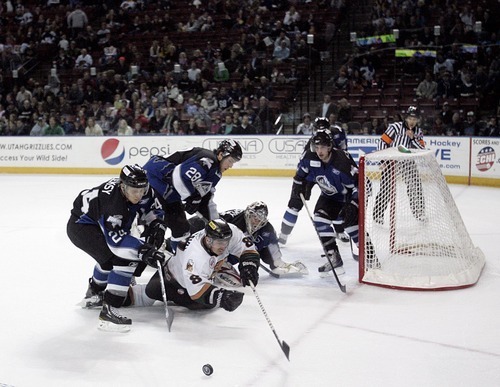 Djamila Grossman | The Salt Lake Tribune The Grizzlies' Tom May, 14, drives the puck across the ice as the Idaho Steelheads' Aki Seitsonen, 17, and Cody Lampl, 2, try to block him, during a game at the Maverik Center in West Valley City, Wednesday, Jan. 12, 2011. Idaho won the game. Djamila Grossman | The Salt Lake Tribune The Grizzlies' Matt Clarke, 15, and David Schulz, 22, cheer for Tyler Ruegsegger, 16, who scored the first goal against the Idaho Steelheads during a game at the Maverik Center in West Valley City, Wednesday, Jan. 12, 2011. Djamila Grossman | The Salt Lake Tribune The Grizzlies' Brett Parnham, 28, looks back at the Idaho Steelheads' Matt McKnight, 19, as he drives the puck across the ice during a game at the Maverik Center in West Valley City, Wednesday, Jan. 12, 2011. Idaho won the game. Djamila Grossman | The Salt Lake Tribune The Grizzlies' Tyler Ruegsegger, 16, and Idaho Steelheads' Steve Oleksy, 24, drive the puck across the ice during a game at the Maverik Center in West Valley City, Wednesday, Jan. 12, 2011. Idaho won the game. 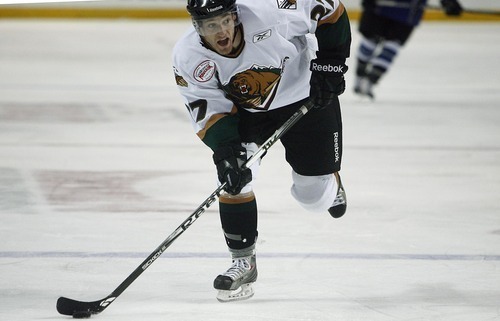 Djamila Grossman | The Salt Lake Tribune The Grizzlies' Brent Gauvreau, 27, drives the puck across the ice during a game against the Idaho Steelheads at the Maverik Center in West Valley City, Wednesday, Jan. 12, 2011. Idaho won the game. Djamila Grossman | The Salt Lake Tribune The Grizzlies' Giffen Nyren, 55, and Idaho Steelheads' Geoff Irwin, 15, try to reach the puck during a game at the Maverik Center in West Valley City, Wednesday, Jan. 12, 2011. Idaho won the game. Djamila Grossman | The Salt Lake Tribune The Grizzlies' Marcus Carroll, 8, reaches for the puck as several Idaho Steelheads players try to block it, during a game at the Maverik Center in West Valley City, Wednesday, Jan. 12, 2011. Idaho won the game. Djamila Grossman | The Salt Lake Tribune The Grizzlies' Hugo Carpentier, 49, and Idaho Steelheads' Steve Oleksy, 24, try to gain control of the puck, during a game at the Maverik Center in West Valley City, Wednesday, Jan. 12, 2011. Djamila Grossman | The Salt Lake Tribune The Grizzlies' Nick Tuzzolino, 74, and the Idaho Steelheads' Cody Lampl, 2, get into a fight during a game at the Maverik Center in West Valley City, Wednesday, Jan. 12, 2011. Idaho won the game. Djamila Grossman | The Salt Lake Tribune The Grizzlies' Tim Crowder, 40, tries to take over the puck from the Michael Neal, 28, during a game at the Maverik Center in West Valley City, Wednesday, Jan. 12, 2011. Idaho won the game. Djamila Grossman | The Salt Lake Tribune The Grizzlies' Hugo Carpentier, 49, defends the puck against the Idaho Steelheads' Geoff Irwin, 15, during a game at the Maverik Center in West Valley City, Wednesday, Jan. 12, 2011. Idaho won the game. 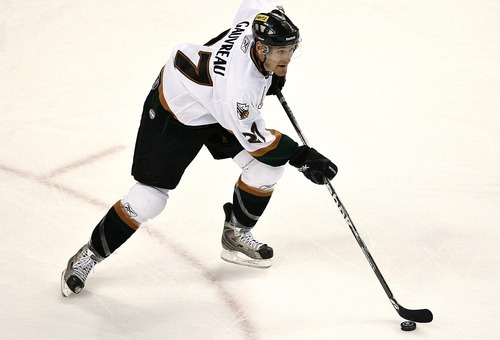 Djamila Grossman | The Salt Lake Tribune The Grizzlies' Brent Gauvreau, 27, drives the puck across the ice during a game against the Idaho Steelheads at the Maverik Center in West Valley City, Wednesday, Jan. 12, 2011. Djamila Grossman | The Salt Lake Tribune The Grizzlies' goalie Andrew Engelage, 32, and Matt Sorteberg, 17, block the goal against the Idaho Steelheads' Kael Mouillierat, 9, during a game at the Maverik Center in West Valley City, Wednesday, Jan. 12, 2011. It's hard to pick on the Grizzlies' recent hot streak, during which they won 10 out of their last 13 games. The common factor in the defeats? 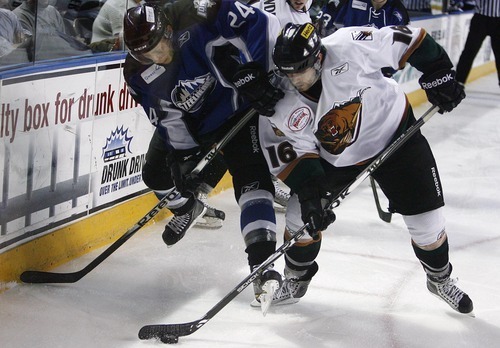 The Idaho Steelheads. 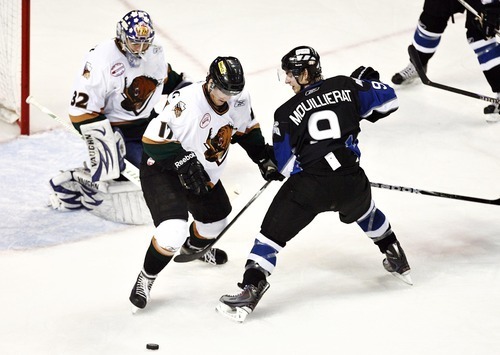 Idaho took down Utah again Wednesday night at the Maverik Center in a frustrating 4-2 loss for the Western Conference leaders. "We just had a goalie we couldn't beat," coach Kevin Colley said. "I'm not disappointed with the way we played. We had a few defensive breakdowns, they got some early goals, and we couldn't get enough shots by them." 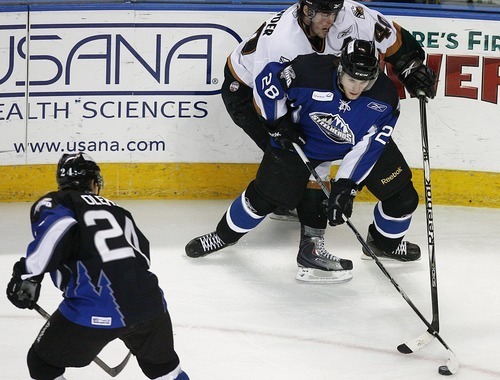 The Steelheads built their lead in the first period with two goals, one on a power play near the end of the period. They cemented their lead in the third with goals from Matt McKnight and Mark Derlago. 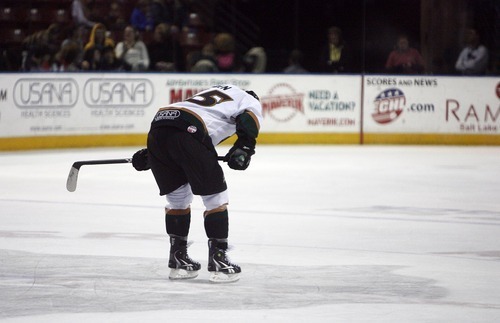 "Idaho is the kind of team that you have to put away early," Tyler Ruegsegger said. "You just have to score goals and try and keep five guys on the ice. We just left too many goals out there." Although Grizzlies goalkeeper Andrew Engelage was named the ECHL's goalie of the week Tuesday, it was safe to say Idaho had the better performance in goal last night. Jase Weslosky dazzled with 40 saves, including a few one-on-one stops. Ruegsegger was able to break through in the third period with a midrange shot, and Brent Gauvreau added another with 3 minutes left in the game. But the scoring came too late for Utah to make up the sizable deficit. 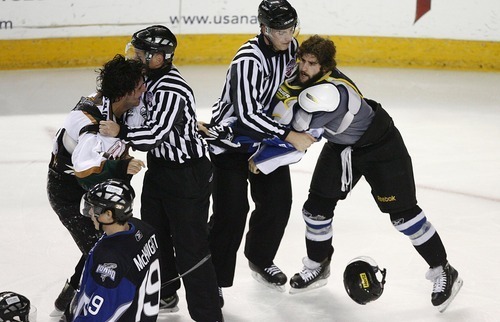 The evening featured several feuds, including a gloves-off fist fight between Brock Willson and Idaho's Matt Tassone. All told, there were 20 penalties in the game. 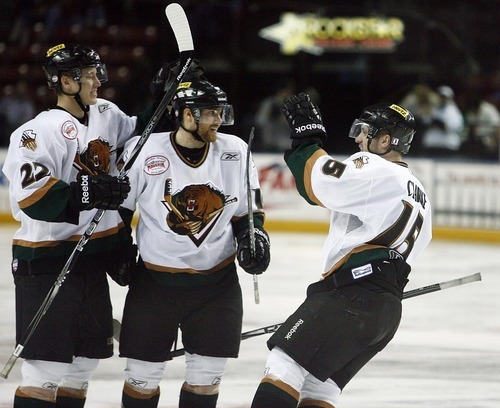 The Grizzlies maintain their hold over the Western Conference and are tied for first place in the ECHL. Colley stumped for his team's performance despite the loss. R Idaho goalie Jase Weslosky stymies Utah's offense early on with a 40-save performance.